1. Rinse the pigeon peas in a couple changes of water. 2. In a large soup pot, combine the squash, drained pigeon peas, tomato, coconut, turmeric, cumin, and enough stock to cover. Bring to a boil, and then simmer, covered, 20 minutes. Remove the cover and simmer another 10 minutes. 3. In a small skillet, warm the canola oil until shimmering. Add the mustard seeds and when they stop popping, add the red pepper flakes, garlic, and salt. Swirl the skillet so the contents cook evenly, and cook another 10 seconds. Then pour the contents of the skillet into the soup, along with the salt. Spoon a ladleful of soup back into the skillet (it will sizzle, be careful! ), and pour back into the soup pot. Finish with the agave, lime juice, and cilantro. Adjust the seasonings, to taste. This recipe sounds absolutely amazing! One for the weekend I think! I’ll let you know how it turns out. I can’t wait. I can’t believe how often you churn out recipes. I barely get time to cook twice a week let alone every day. What very beautiful soup! 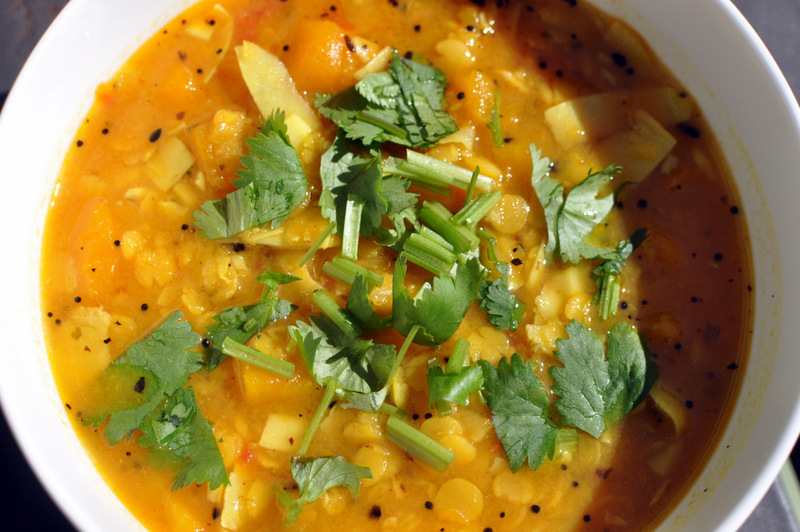 It looks like the sort of thing I’d love, but I like almost any sort of dal soup. Lovely! I am very jealous of your homegrown squash! Andddddd…bookmarked! I use blogging as a form of procrastination as well…but I also just really love it. I’m pretty sure I’d love this soup so much I’d feel compelled to post about it ASAP…however there’s only one way to find out! Time to get cooking! wow, that looks superb, love the color and specially in flavors going in there. Yum! As you started listing the ingredients, I was saying “check” to each one right along with you! I would probably like this as a blended soup too, but then you would lose all the texture…I’m just wondering how the coconut would turn out if I used shredded dried coconut – did yours soften a lot? Good to know! This is on my list of things to make…I’ll have to keep my eye out for large flake coconut too, I never see it anywhere! Pinned, because I want to make sure I don’t forget to make this. It looks divine! i am seriously procrastinating of making my pins.. well moms here, so all these will get made only when i get my ktichen back.. the stew looks perfect! A delicious looking late-summer stew, will definitely be trying this one. Thank you so much for all your entires into Simple and in Season this month, a round-up will follow today. 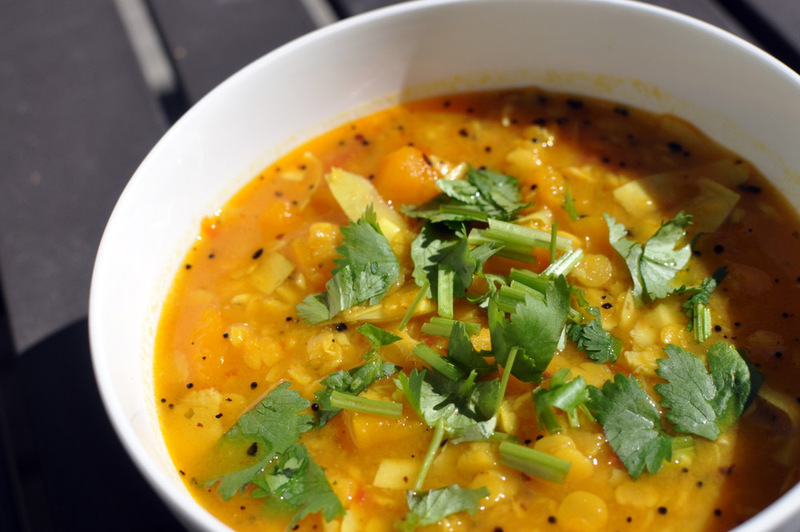 squash-lentil soup looks fabulous and just right for this season, and with coconut..yumm… will definitely try it your way..thanks so much for sending it to Healing foods event. That sounds like my checklist too 🙂 But I wish I could add one more thing: man to help with blogging! I bet that sure helps when blogging starts to feel like a chore! We’ll try this soon, it is a great excuse to use the fresh coconuts here and looks lovely, great pic! I just made this for dinner and I’m SO glad I tried it! It was so flavourful, I couldn’t stop saying “mmm” after every bite! I also managed to find the large flake coconut, so I used that and loved the texture. Thanks for sharing the recipe! I’m happy you share Rob’s dishes too! This soup sounds amazing. I really need to branch out from red split peas. This was delicious! I left out the red pepper flakes because I’m very sensitive to spicy foods since I’ve been on a high raw diet. This dish did not work out for me. It was an odd mix of too many flavors. I think it could do without the tomato, cumin, lime and coconut, and instead increase the tumeric, and add cardamon which lets the flavor of butternut shine through. Now I need to figure out how to salvage my dish.